We’re heading to the CIM Convention in Montreal from April 28 – May 1. As we got to planning our booth, my team and I took some time to reflect on the dangers of modern Canadian miners — especially those who may new to the industry. 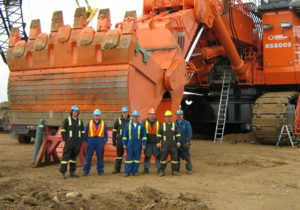 A large portion of the work we do is in the mining and resource sector. By its very nature, underground mining presents a unique set of safety hazards that are completely different than other industries. Some of these hazards, like ground instability, are inherent to the environment itself, while others are introduced by the complex processes that mining requires. As mines delve further underground and get bigger, the risks increase and serious injuries, death or illness can occur if not managed appropriately. That being said, mining is a pretty exciting business and Canada has a thriving mining industry that contributes tens of billions of dollars to our economy every year. With over 3,000 equipment and service providers and more than 60 different minerals and metals being produced, Canada has the third largest mining supply in the world. The Mining and Mineral sector employs approximately 370,000 Canadians and is a challenging and innovative field to choose a career in. So if you’re thinking about a career in the mining industry, or just want to know more about safety in this unique sector, here is a list of five key tools anyone new to the mining industry should understand. Fires pose one of the greatest safety threats to mines. Diesel fuel, grease, combustible materials, and flammable liquids/gases combined with ignition sources like heat, electrical or mechanical energy all increase the risk of fires in mines. With mines generally located remotely and in underground areas that are hard to reach, access to fire-fighting resources is extremely limited. To control the risk of fire early on, it’s critical to have fire suppression system installed not only on vehicles underground, but in surface mines as well. You can think of fire suppression as a big fire extinguisher built right into mobile and fixed equipment, with the ability to detect and extinguish a fire without the need for human interaction. Reliable and well-maintained fire suppression is crucial to keeping crews and equipment safe and production on schedule. In recent years these systems have been extremely complex in pursuit of effectiveness. Mines are vast and expansive places, often covering hundreds of kilometers and employing hundreds of workers. In such a hazardous and remote area, it’s absolutely essential to know the location of your miners and their equipment in real-time in the event of an emergency. With the ability to track everything that’s important in your mine, you’re not only ensuring safety, but you’re also maintaining productivity. This is available through both Wi-Fi and RFID real-time tracking (check out our sister company, Northern Light Technologies, for more information). In order to track assets and people, you also need a wireless network and a software management tool to get information according to zone, time or asset. Something like NLT Digital Mine software can also be used to track equipment production data, environmental monitoring, alarms and much more. As important as it is to track your people and assets, you’ve also got to be able to communicate with them. Being underground poses challenges to maintaining the ability to connect with your workers and VoIP is quickly becoming the communication method of choice for many mines once they’ve deployed their digital networks. According to the CDC, “miners are at risk of developing lung diseases called pneumoconiosis because of their regular exposure to hazardous airborne dust like silica, and miners who are exposed to exhaust from diesel engines have an increased risk of dying from lung cancer.” The amounts of respiratory hazards that exist in a mine are vast, and it’s essential to protect workers from contaminated air with suitable respiratory protection. While most people visualize the “paper mask” or N95 when they think about respirators, there’s actually a vast array of respiratory products on the market. Selection of not only the mask but the airflow and cartridge needs to be matched to the hazard. The need for gas detection varies greatly depending on the type of mining taking place. Some of the hazards that exist include gases expelled during blasting, methane escaping from coal beds, vehicle exhaust and drilling into stagnant water. With such a variety of mining sectors in Canada, any of these factors can contribute to air quality issues. Gas detection needs to be specific to the hazards that exist; you may need several different types to protect workers. Ventilation in underground mines is also important, so not only do we measure for hazardous gases but also airflow, heat and humidity. So there you have it, five key areas that are only just the tip of the iceberg. If you are attending the CIM show, be sure to stop by our booth (#822) to learn more about how Levitt-Safety can help equip you with everything you need to stay safe in mining!